As in Egypt, the uprising in Turkey is seeing the hyper-intense “ultra” soccer fan clubs at the center of the nation’s revolt. Mark Twain’s maxim that “History does not repeat itself, but it does rhyme” is echoing in the streets of Istanbul. 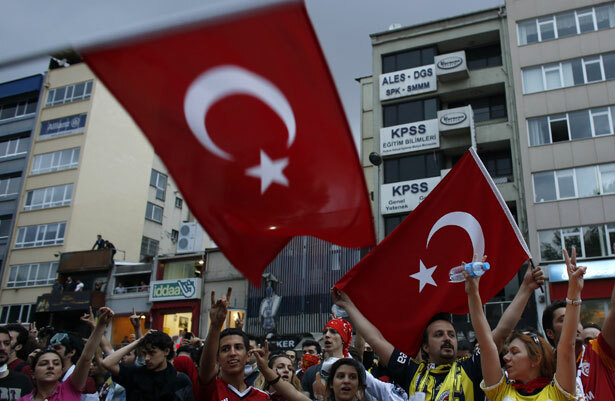 The echo is heard in everything that makes Turkey resemble a sequel to the 2011 Egyptian Revolution that toppled assumed President-for-Life Hosni Mubarak. I’m not only referring to the fact that it marks another internal revolt against an iron-booted US ally. I’m not only referring to the repeat of the social equation that neoliberal shock economics plus police repression will equal upheaval. I’m talking about soccer. More specifically, the role that organized soccer fans are playing by the thousands. Turkey and Egypt are of course two very different countries with different leaders, different political systems and different histories. But the revolt of the highly intense, usually apolitical “ultra” soccer-fan clubs must be noted. As in Egypt, for years the ultra soccer clubs have been places in Turkey where young, alienated men could express aggression without fear of serious retribution from the state. They were places a young man could release steam, get in a brawl with other fan organizations or the police and receive at worst a beating. In contrast, attending a political demonstration—or writing an article about the political demonstration—could land you in prison. For the state, ultra clubs have been seen as ways to channel anger in a direction that doesn’t threaten their power. After the last two years, they may need to revise their playbook on how to manufacture consent. The fan group known as Çarşi has reportedly led this uniting of the ultras. Çarşi is also the ultra group most associated with the political left. Just so there is no doubt about where they stand, the "a" in Çarşi is the anarchism is the anarchism symbol and their slogan is “Çarşi is against everything!” Tensions were already extremely high between Çarşi and the security police when a post-match march, after their team Beşiktaş J.K. was victorious, strayed too close to Erdogan party headquarters, resulting in more gassing and violence than the typical ultra/police skirmish. The difference, of course, is that they are directing their rage at the police in the name of basic democracy. The difference is that instead of representing merely their team, they are “Istanbul United." Like the ultras in Egypt, their very existence should be pushing sports writers, academics and sociologists to rethink the very stale conventional wisdom about sports fandom: that its most prominent feature is that it’s devoid of all politics and actually serves to steer people away from struggle. In the case of the Turkish ultras, they are citizens with the same concerns as anyone else. The difference is they bring mass organization and the art of street combat to this dynamic stage in Turkey’s history. Sports fans—again—playing a leading role in a mass social uprising? Welcome to the twenty-first century, where the revolution is not only televised: it takes place in between games.